It was a very stormy day on the coast and I had a hard time trying to keep rain and sea spray off my lens having forgotten my umbrella or a shower cap to cover my camera...yes, cheap shower caps are an essential tool for the landscape photographer. While waiting for a possible sunset I explored up and down the beach and came across these rocky channels. I was intrigued with the water flowing in and out and straddled myself and my tripod as low as possible across the channel to avoid getting any more wet than I was. Hiking back to the car with wet, crunchy sand in my shoes was not the way I wanted to end the day. 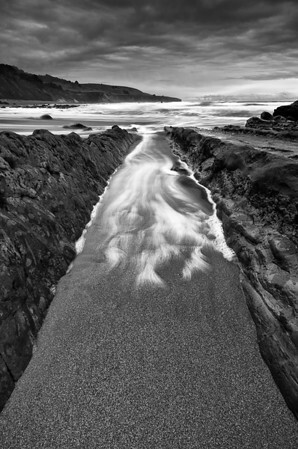 I watched the surge and timed it as the water flowed out allowing for the smooth, sandy foreground to counter the textured rocks and drama of the moody sea and sky.